I'll be able to make it strong enough to last a long time. transformation in a future post. Until then, happy mini-making, everyone. What do you do if a) you realllly want a dollhouse and b) are allergic to the products (MDF and plywood) that most dollhouses are made of? 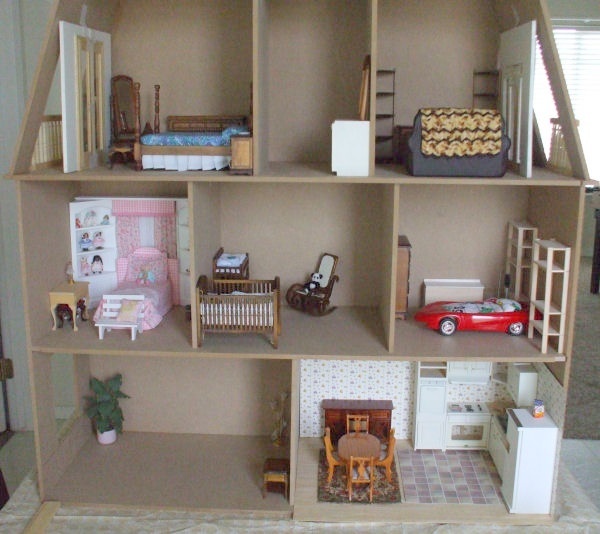 I developed an allergy/chemical sensitivity to the VOC's (volatile organic compounds) that offgas from MDF and plywood a couple of years ago while making this dollhouse. the furnishings prior to painting, papering, and wiring. Since then, I have been "between dollhouses" as I looked for an affordable alternative that met my requirements for both size (had to fit against a wall like the one above) and number of rooms. Unable to find one, I turned to trying to find something that would seal in the offgassing vapors, thereby eliminating the problem from its source. 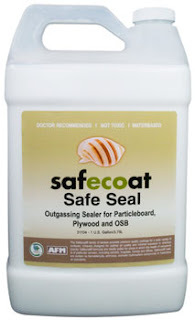 I learned about a product called Safe Seal* that, when applied to the mdf prior to gluing together, painting, or wallpapering, claims to virtually seal in the VOC's and prevent them from off-gassing into the environment. with a plastic sheet. I used weights to flatten out the warpage. So now the big question ~~ did it work? My current feeling is that it helped significantly although it did not remove the fumes entirely. I did give each piece, including all of the edges, about half a dozen coats. The directions state that one coat is usually sufficient, but in this case the fumes were particularly pungent and it took repeated coats to reduce the odor enough that I am hopeful I will be able to tolerate it with the exception of one board -- the first story ceiling/second story floor -- which is a lost cause. Numerous coats have not been successful in blocking the odors sufficiently and I'm going to have to substitute some foamcore for that piece. I think foamcore will be ok as I'm not planning on putting anything very heavy in that room. Perhaps I'll use two pieces of foamcore stacked on top of each other for double strength. 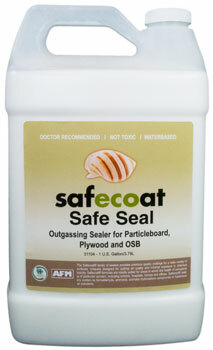 In conclusion, I'm hopeful that with the exception of that one board mentioned above, the sealer reduced the off-gassing enough that I'll be able to tolerate it in my small workshop. Let's keep our fingers crossed! 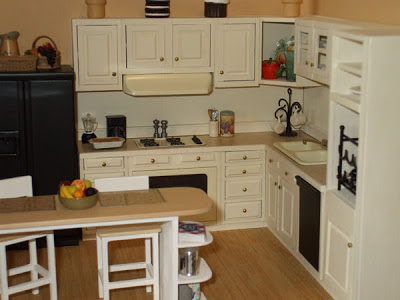 And next time I'll share how I updated a tired and outdated mass-produced fridge from the mid-90's (see above photo for the "before") into something any self-respecting miniature kitchen would be proud to 'wear'. Ok, that might be an exaggeration, but you can decide for yourself when you see the "after" pic(s) next time.